The opening pages of The Gemini Effect signal that this is a story full of horror, the sort of horror you will find when relentless mutant monsters are set loose on a mostly defenseless American mid-West. The hordes of first vampire/zombie rats, then affected humans, and finally killer birds create a terror that simply never relents in an extremely fast-paced thriller. Chuck Grossart is very descriptive of the rather implausible events (how could thousands of killer creatures be created in such a short time period? ), of the military equipment and personnel, and of the scientists seeking a solution to the expanding apocalypse. He’s less successful when he interjects a second plotline, of third-generation Soviet sleeper agents with the power to immobilize the president of the United States. It’s as if two books were squeezed together which works on some levels, but the White House storyline is even more implausible than the hordes of seemingly unstoppable monsters transforming and replicating underground. The author deserves major kudos for his storytelling style which makes this novel a page-turner that engages the reader for much of the novel. I admit, I never understood why the creature’s quickly established weakness of being unable to endure light was never developed into useable weapons and the nation’s leaders resort to other devastating options to kill the mutants. The final chapters are even more difficult to accept as the entire globe erupts into various wars completely unrelated to the American scourge. It would be unfair to describe the ending other than to say much of what happens doesn’t make much sense, considering the biological agent that accidently started it all shouldn’t have the clout to do what it does. 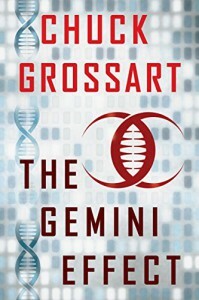 Still, I recommend The Gemini Effect for readers who like their reads fast and furious with little in the way of character development. For the record, the book is apparently a substantial revision of an earlier edition titled The Mengele Effect, a title that actually makes more logical sense. While the book seems to be a stand-alone effort, there are threads left dangling for at least one possible sequel.